Steve's Beemer & Benz Inc. 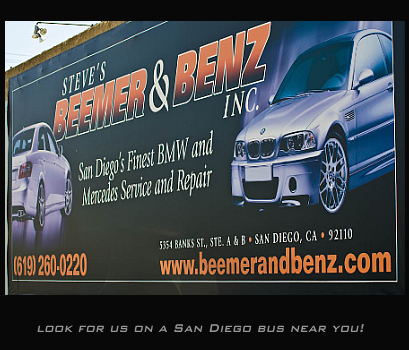 Since Steve’s Beemer and Benz first opened in San Diego in 1986 our focus has been reliable, quality service provided by some of the most knowledgeable Mercedes and BMW staff in the business. Our desire for unparalleled customer service has built a broad base of dedicated clients, from all over the country, who have not only relied on our quality repair service for many years, but will continue to come back again and again for the quality of workmanship and the service they have grown to expect. You can rest assured that at Steve’s Beemer and Benz you will always be provided nothing but the very finest in Mercedes and BMW service in San Diego, California.